Who can access presentations on the IASLC Library? All Conference Delegates will receive access to the presentations that were recorded during that particular Event. Active IASLC Members that did not attend the event will have the option to purchase access. The Library is only available to IASLC Members and those with an Access Code. The Access Code is a unique identifier that adds an event to your account. For Conference Delegates, your Access Code is your Reference ID that is printed on your Conference Badge. I attended WCLC 2017, how do I receive access to those presentations? Click here to enter your access code. 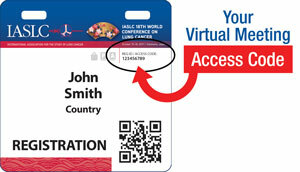 You will be required to either create an account or login with your IASLC Membership credentials. Do I need to enter my Access Code every time I want to access the Library? No, you only need to enter the code once and then follow the steps to setup or verify your IASLC Library Login Details. Your user name will be the email address you used along side the password that was entered. Click here to login or submit a password reset request. I enter my Access Code but I receive an error. Your access code has either already been registered or you may not be entering the correct code. If you have already inputted your access code and setup your user name & password, you will not need to re-enter the access code anymore. Please verify you are using the correct user name and password. If you need to reset your password, please use the Reset Request located on this page: http://library.iaslc.org/login. IF you are an IASLC Member but not in active status, and do NOT have an Access Code, you will need to renew your membership before being able to log into the conference. When will presentation be available? Presentations from conferences are generally available 24 hours after the scheduled time of the live presentation. A "Now Available" flag will appear beside sessions that have presentations loaded within them. It's been 24 hours but the presentation is not showing? On the rare occasion, additional post editing maybe required to the presentation which may result in a delay posting it Online. We'll make sure the presentation is ready as soon as possible! What is the playback format of the presentations? Video, Audio, Slides? Depending on the session, some presentations may contain video of the Speaker. All presentations (except Posters) are offered with audio and visual slides. Yes! A link to download the PDF of the slides is available under the slides tab of a presentation. Can I view presentations on my Tablet or Smart-phone? Yes, presentations can be viewed on mobile devices. Can I download the presentation to watch when not connected to the Internet? Unfortunately no. You will require an high speed Internet connection to stream the presentations. Can I view presentations from Work or Home? Absolutely! As long as you have an Internet connection, you will be able to view the presentation. Can I pause a presentation and resume it later? Yes! Play, Pause or Rewind whenever you need to. You will need to leave that presentation open on your computer. If you reopen the presentation it will start from the beginning. Video playback available in HTML5 and Flash in order to provide a wide range of compatibility across most devices. Computer: 99% of Computers will be compatible with the video player. If you are able to see Youtube.com videos, you will be ok.
Windows: Windows Intel Pentium 4, Windows XP, Windows 7 or higher. Mac: G4, G5 or Intel processor. Apple OS X version 10.4 or better.